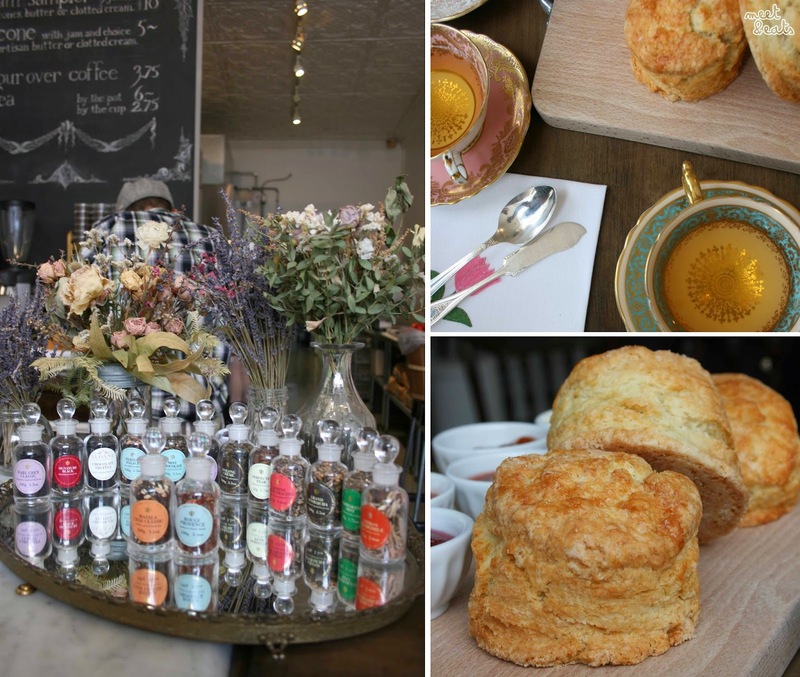 On the hunt for a sweet treat and cuppa’ tea to further introduce my darling newbie Aussie sister to the city – we took a 25-minute stroll to Kitten & the Bear. Having been warned of the simple, hardly-dining shop, we entered, turning a nostalgic faux glass doorknob to be greeted by a counter a brief three meters away. The cafe, former a shop front from where customers could purchase the Kitten & the Bear‘s fresh, homemade jams and stocked teas from Sloanes. I am glad that they have found space to fit two tiny tables, making it a delightful spot to sit and catch up with a bud. Kitten & the Bear is owned by a husband and wife, I admire their passion for the products that they serve, I especially love the homey feel that the place provides. They also had big baskets of both peaches and nectarines plopped in a few corners of the cafe, they all looked so succulent and had us eager to get ordering. 14 Sloane Teas are available for serving up – from the more adventurous, Chocolate Truffle, to the plain ol’ Earl Gray Tea. The utensils provided are a teaspoon, and butter knife. 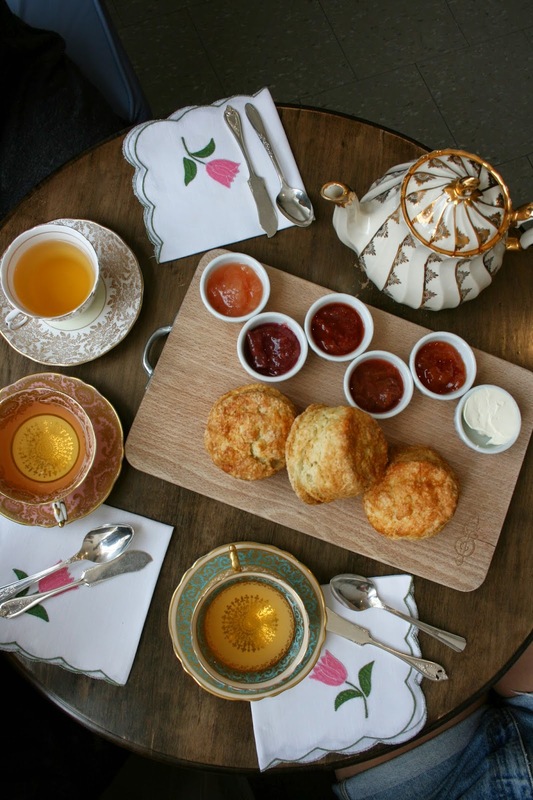 You can almost smell the large scones, that were served up to us – one each was just enough for each of us. Being a party of three, we were asked if we wanted to be set up a perfect platter for the three of us, that way we can try all five jams, and have a scone each – this not only saved us a few dollars, but it was also the perfect amount to satisfy each one of us! How beautiful the fine China was – artistically hand-picked, every picture was absolutely perfect. The Clotted Cream was a real delight that is served to spread onto your daily-made scones, this is an option that you can pick, against plain ol’ butter – I definitely recommend going with this! out of the five jams, the two I’d note for absolute recommendations in the future, are the White Peach & Fresh Wild Elderflower and Garam Masala Spiced Nectarine. The White Peach & Fresh Wild Elderflower was, unexpectedly, such a precious flavour – it held it’s honey-fragrance, shining these flavours through, with fresh, fine pieces of of White Peach as well. It was acclaimed by my sister and my mate that the Garam Masala Spiced Nectarine was a peculiar flavour, and definitely had to be laid on rice – but this one was strangely another one of my favourites! The Indian Spice blend into such a like-sweet Nectarine, was ingenius! I kept going for more. 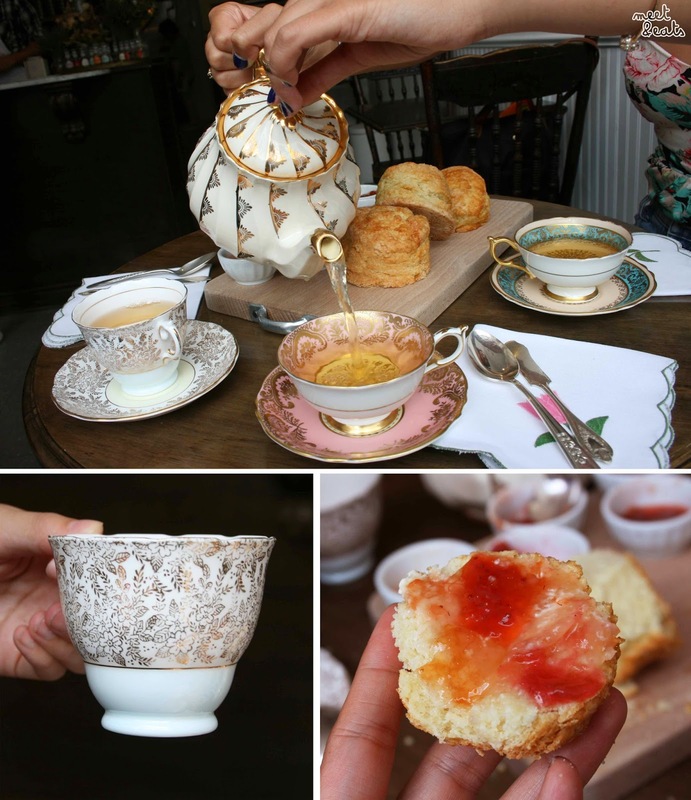 We went for a (boring) Jasmine Tea (by pot, $6), upon a majority-rules kind of decision, it smelt beautiful and was a great, muted flavour to go with the flavoursome Jam and Scones. You can see the fine detail each teacup had – beyond words! 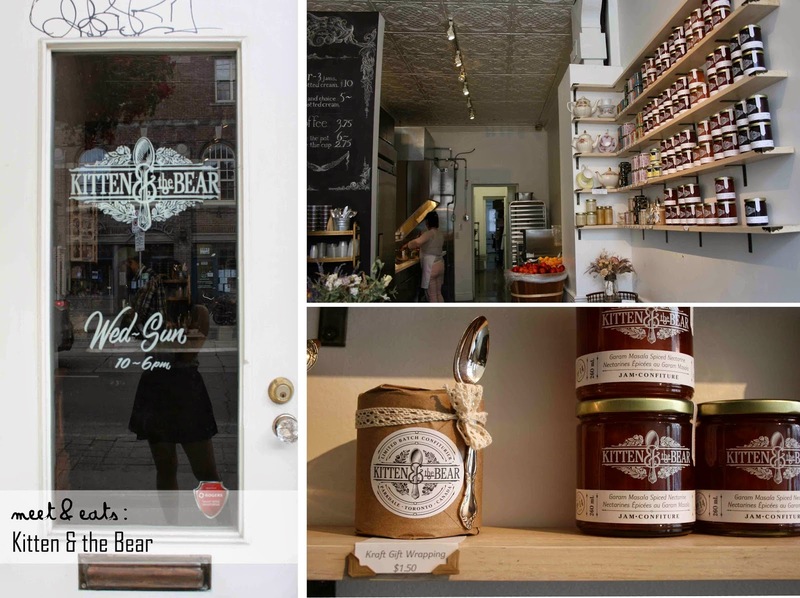 The Kitten and The Bear also sells Teapot sets, Sloane Tea and House-made Jams in the most marvelous packaging! 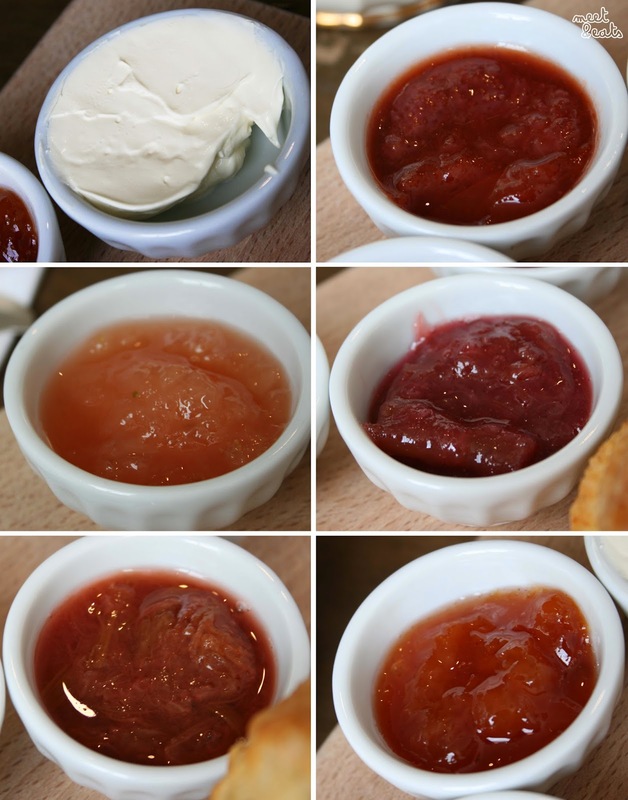 I can imagine any of these to be the perfect gift for a Tea or Jam Fanatic. The last shot features all three jams spread onto a piece of Scone, delicious! We each had a lovely time here, the service was very relaxing and the nibbles that we had were downright fantastic, at a fine cost ($7/ea~)! I cannot wait to bring my beautiful Aunt down here with me, memories of our teatime picnics, laying down a mat in the living room of my grandparent’s house when I was nine years old will be lived once again!